Is it possible to decongest road ? – what would be people’s reaction ?? Chennai is overcrowded. There are traffic snarls everywhere. 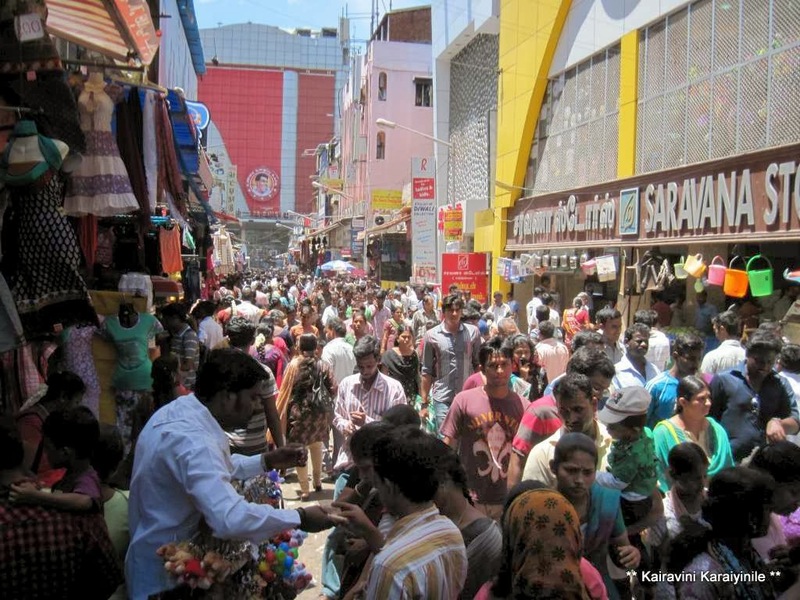 Those visiting Chennai could afford to miss Chennai Central / Egmore but not the bustling Thyagaraya Nagar (T Nagar) – the textile kingdom - famous of them being : Nalli Silks, Kumaran Silks, Kumaran Stores, the Pothys, Chennai Silks, Saravana Stores, Jayachandras, Sri Krishna Collection and many more on the pavements and on multistoreyed buildings ………… there are equal no. of shops selling gold ornaments and any given day you can find maddening crowd of people buying gold, silk, textiles and many many more things. It would take special skills to navigate inside Ranganathan Street housing Saravanas, Jayachandras on festival days. …. .. .. till recently, the pavement shops of Pondy Bazaar were attractive ! From the arterial Mount Road at Teynampet Junction [Aalayamman Temple] – this straight road leads to Panagal Park – half of the stretch is the famous Pondy Bazaar – the area is quite famous for its market – there are so many shops – Garment [Cambridge / Naidu Hall / Ramraj / Big Bazaar to name some]; Hotels [Saravana Bhvan, Hot Chips, Geetha Café, Andhra hotel …. ..]; pearl and jewel shops / couple of plazas / Ratna Stores; row of flower shops and much more besides the pavement shops that once existed. Pondy Bazaar, officially is Soundarapandian Angadi, named after politician W. P. A. Soundarapandian Nadar whose statue is situated in the square. T Nagar suffers from slow-moving traffic. To ease the traffic, the Metropolitan Transport Corporation diverted buses going to the T. Nagar bus terminus that used to go via Pondy Bazaar. In Nov 20, a trial run of Pedestrian plaza at T Nagar was tried out and today was the second attempt. It was tried at area from Bashyam Road (Panagal Park) to Dr Nair Road from 8 am to 5 pm as part of the Smart City plan of Greater Chennai Corporation. Only Metropolitan buses and two-wheelers were allowed on Pondy bazaar and vehicle parking was totally banned on sides of the road. Eco-friendly battery operated cars were operated within pedestrian zone on both the sides of Thyagaraya Road to take care of senior citizen, differently abled, children and pregnant women for the short distance commutation within the pedestrian plaza zone, a Corporation press release said. In addition, to enhance interest among pedestrians/shopping commuters, some activities on health, drawing competition and recreational activities on smart city for children and appropriate street plays were done. While buses ran, Cars, autos, share autos, vans were denied plying on Thyagaraya Road. The vehicles were diverted at Dr Nair Road to pass through Thanikachalam Road. Vehicles were directed to parked at Multi Level Parking (MLP) Site opposite to Hindustan Petroleum bunk on Thanikachalam Road and on the on-street parking space available between Boag road junction and Dr Nair road junction. By mid-noon, the road appeared eased of traffic and free for people to walk. The immediate response was one of welcome, yet only time will tell whether this operable and whether people will appreciate the measure, having to bear with some small inconveniences. Here are some photos taken today at T Nagar Pondy bazaar. Some will recall that in May 1982, there was exchange of fire - LTTE leader V. Prabhakaran and rival Uma Maheswaran exchanged fire at Pondy Bazaar – a couple of persons were injured too. After 3 decades , a city court formally dropped charges as both of them were not arrested and are not alive ! Clive Hubert Lloyd has things easy – he had Gordon Greenidge, Desmond Haynes, Viv Richards … in his batting line-up and never ending battery of fast bowlers – Andy Roberts, Michael Holding, Croft, Garner, Malcolm Marshall and more – he had a very successful streak in Frank Worrel Series in 1984-85 having won 3 in 4 tests – Test no. 1006 in Dec 1984 at Sydney was his farewell to Test Cricket. He was not to relish - Australia won by an innings and 55 runs with more than a day to spare. That was West Indies' first defeat since they lost, also to Australia, at Melbourne 27 Tests earlier in the 1981-82 series. The architects of such a complete reversal were the Australian spinners, Holland and Bennett, who had bowled New South Wales to victory over the West Indians earlier in the season. Bob Holland hailed Sydney bowler was to take 10 wickets trouncing the mighty WI. A couple of years later, at the same venue, he suffered at the hands of Indians. Srikkanth made 116 off 117 deliveries in Jan 1986; years later Ravi Shastri made a double and Sachin 148* on a match when Shane Warne made his debut. Sydney is a famous tourist spot. Forty Thousand Horseman, a 1940 Australian war film directed by Charles Chauvel about the story of the Australian Light Horse (mounted rifleman as distinct from cavalry) which operated in the desert at the Sinai and Palestine Campaign during World War I, was shot here. We know it too well - the popular Shankar film “Indian” – one of the hit songs was ‘telephone manipol sirippaval ivala – Melbourne malarpol melliya magala” – though the lyrical reference was to Melbourne, it was Sydney and its famous bridge !! Surrounded by hundreds of kilometres of shoreline, national parks and historic sites, the sparkling waters of Sydney Harbour are synonymous with Australia’s most famous city. Alive with ferries, yachts and kayaks, one of the world’s great natural harbours is also a gateway to other parts of Sydney. The Sydney Harbour Bridge is one of Australia's most well known and photographed landmarks. It is the world's largest (but not the longest) steel arch bridge with the top of the bridge standing 134 metres above the harbour. It is fondly known by the locals as the 'Coathanger' because of its arch-based design. It was as early as 1815 that Francis Greenway proposed building a bridge from the northern to the southern shore of the harbour. It took some time for this to become a reality with design submissions invited in 1900. The Sydney Harbour Bridge construction started in 1924 and took 1,400 men eight years to build at a cost of 4.2 million. Six million hand driven rivets and 53,000 tonnes of steel were used in its construction. It now carries eight traffic lanes and two rail lines, one in each direction, but at the time of its construction the two eastern lanes were tram tracks. The Bridge has an interesting past including its official opening on 19 March 1932. Before the NSW Premier, the Honourable John 'Jack' T. Lang, could cut the ribbon to signify the opening of the Harbour Bridge, Captain Francis De Groot of the political group The New Guard slashed the ribbon with his sword. Captain De Goot believed that the only person to open the Bridge should be a member of the Royal Family. Captain De Goot was detained, the ribbon tied together, and the Premier then officially cut the ribbon. Now the news is of the two grand dames of the cruising world, Queen Mary 2 and Queen Elizabeth, meeting in Sydney Harbour in the early hours of Saturday morning. Queen Mary 2 passed through Sydney Heads first arriving at Circular Quay at 6.20am, with Queen Elizabeth following closely behind and anchoring at Athol Buoy near Taronga Zoo. 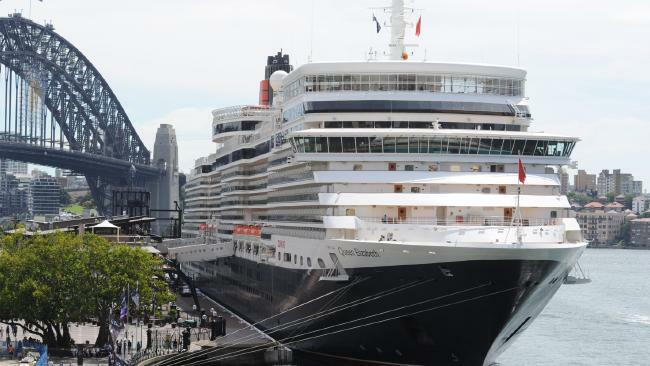 It's reminiscent of another dual Sydney harbour arrival almost a decade ago when the QM2 and the now retired older sister of QE, Queen Elizabeth 2, brought the city to a standstill. RMS Queen Mary 2 is a transatlantic ocean liner. She is the only major ocean liner built for Cunard Line since Queen Elizabeth 2 in 1969, the vessel she succeeded as flagship of the Cunard Line. The new ship was named Queen Mary 2 by Queen Elizabeth II in 2004 after the first 1936 namesake ship RMS Queen Mary. Queen Mary was in turn named after Mary of Teck, consort of King George V. With the retirement of Queen Elizabeth 2 in 2008, Queen Mary 2 is the only transatlantic ocean liner in line service between Southampton and New York, which operates for part of each year. The ship is also used for cruising, including an annual world cruise. Queen Mary 2 was intended for routine crossings of the Atlantic Ocean, and was therefore designed differently from many other passenger ships. The ship's final cost was approximately $300,000 US per berth. Expenses were increased by the high quality of materials, and having been designed as an ocean liner, she required 40% more steel than a standard cruise ship. Some of Queen Mary 2's facilities include fifteen restaurants and bars, five swimming pools, a casino, a ballroom, a theatre, and the first planetarium at sea. Cunard Line is an Anglo-American cruise line based at Carnival House at Southampton, England, operated by Carnival UK and owned by Carnival Corporation & plc. It has been a leading operator of passenger ships on the North Atlantic, celebrating 175 years of operation in 2015. In 1839 Samuel Cunard, a Nova Scotian shipowner, was awarded the first British transatlantic steamship mail contract. The QM2 is in Sydney until Saturday night as part of its 118-night world voyage before its maiden five-night round trip to Tasmania with calls to Hobart and Port Arthur. A few days earlier QM2 made another first-time round trip in Australian waters from Melbourne to Kangaroo Island. Remastered in 2016 at the cost of $145 million, new features on the liner included 50 new staterooms, nine of which are Britannia single cabins, catering to the growing solo travellers market. 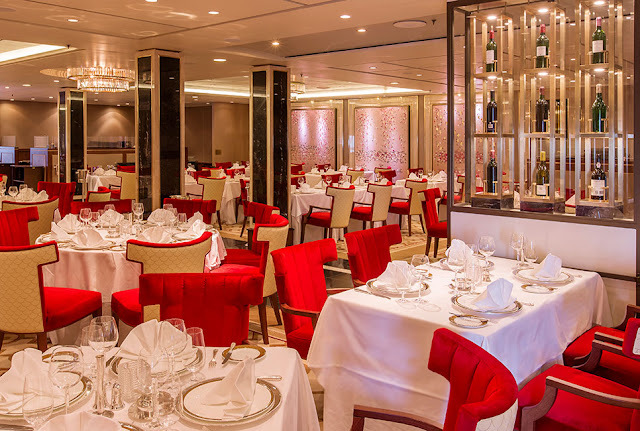 Space is a large part of the appeal for the 345-metre liner that caters to 2700 guests, according to its web. There are five pools, 10 dining options, shops and 14 decks of sporting facilities. While I thought travelling in a cruise ship is all about merry making and spending money – there appears some dress code too. In its web it reads : during the day : Casual shirts, shorts, trousers and beachwear are ideal. The main restaurants require a casual wear dress code for breakfast and lunch, however you may wear shorts in either the Kings Court (Queen Mary 2) or Lido Restaurant (Queen Victoria & Queen Elizabeth). Evenings will be split into 2 different dress codes and its guests are to be notified of the evening's dress code in their Daily Programme. Evening wear consists of an evening or cocktail dress or smart trouser suit for ladies. A tuxedo, dinner jacket or dark suit with appropriate neck wear for men or one may wear formal national dress and military uniform. It further reads that after 6pm, shorts and blue or worn denim (for men and women); sandals and sleeveless tops (for men) are not considered appropriate within the ship. Train no. 18616 ~ Kriya Yoga Express runs 419.7kms from Hatia to Howrah taking 9h 25m for the distance. It is in news ! !The cultivable lands of the place was divided into Don and Tanr. The don lands are the terraced low lands on which only rice is grown; tanr are the uplands which produce a coarse form of rice, known as gora, millets, pulses and oil-seeds. Before you read further, this man had played only 4 tests prior to this ! ~ a description in an old book about Ranchi. Jharkhand is a state in eastern India carved out of the southern part of Bihar in Nov. 2000. The state shares its border with the states of Bihar, Uttar Pradesh, Chhattisgarh, Odisha and West Bengal. The industrial city of Ranchi is its capital and Dumka its sub capital. Jamshedpur is the largest industrial city in the state, while Dhanbad and Bokaro Steel City are the second and fourth most populous cities respectively. The State has so many mines and accounts a very high %age of the mineral reserves of India, yet is one of the poorest States. In olden days, Ranchi was a happy hunting ground for the sportsman (!) – meaning those involved in game hunting, killing of animals – as it was a vast reserve of wild animals, many of which have now disappeared. The name Chutia or Chuta Nagpur [Chota Nagpur] is found in Rennel’s map (1792) and in Hamilton’s Gazetteer (1815) and the latter explains the name stating that the district is distinguished by the term Chuta (little) to distinguish from the other Nagpur possessed by Bhonslah Maratha family –however, some state that the name is probably derived from Chutia, a village close to Ranchi, reputed to be the original home of Nagbani chiefs. In its historic past, Moghul King Jahangir tried to have complete subjection of this part whence diamonds were said to be found of the value of lakh of rupees each and he directed Ibrahim Khan on his appointment as Governor of Bihar to invade the district and drive away the Maharaja. Ibrahim invaded Chota Nagpur in 1616, refused to be satisfied with the few diamonds and elephants which the Raja had sent him, fought and took control of the diamond kingdom. The Raja was captured and sent to Delhi with his diamonds and 23 elephants. The 45th Chief, Durjan Sal was removed from Delhi to Gwalior and kept confined for 12 years. Once there was a diamond of which, the jailed Raja pointed out a flaw – but the Court jewelers were at variance. As a test, it was tied to the horn of a ram and made to fight with another ram which had unblemished diamond on its horn. The former split, while the true diamond remained undamaged. The Delhi Sultan was so pleased and granted his release and also granted that the other Chiefs imprisoned with him might be set at liberty, if he so desires. Jharkhand is set to shine – in a bid to boost the ‘Make in India’ initiative of Hon’ble Prime Minister Shri. NarendraModi, and to develop high value investment opportunities in the State , the Government of Jharkhand led by Chief Minister Shri. Raghubar Das organsiedthe maiden ‘Momentum Jharkhand Global Investors Summit’ in Ranchi. The summit’s aim was to establish Jharkhand as a premier Investment destination for both foreign as well as domestic investors. Addressing the Investor’s summit, Union Minister of Law and justice, Ravi Shankar Prasad, spoke about the development of the country. The Union Minister stated that 111 crore people in the country have Aadhar cards and also speaking on the digital growth of India, Prasad said that in the last two years 72 mobile manufacturers have come in India. Earlier, asserting that Jharkhand is of strategic importance to Adani Group, Adani Enterprises Managing Director Rajesh Adani said it will invest Rs 20,000 crore in the various sectors including investment of ultra mega power plant. The two-day summit, was attended by about 6,200 delegates. The summit’s partner countries were Japan, Czech Republic, Tunisia and Mongolia. On a day Virat Kohli and team began their Test challenge against Australia in Pune, Mahendra Singh Dhoni had a fresh challenge on his hands seemingly oblivious to what's happening in Team India. 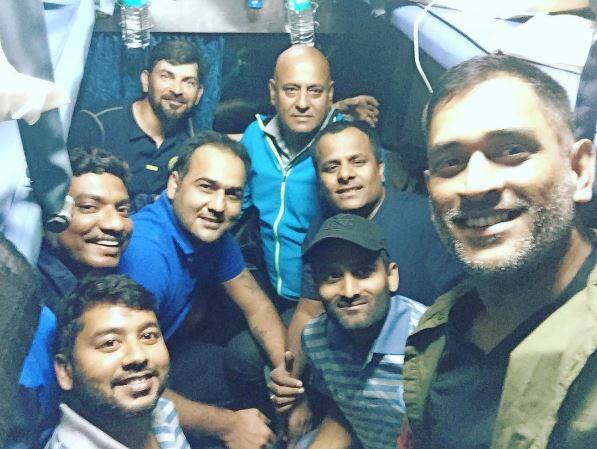 The man, who impresses to be a great leader but relinquished first Test and later ODI captaincy and now with IPL captaincy too going away, made an impressive mark on people’s mind by choosing to travel with his teammates in a train from Ranchi, checked in at Eden Gardens in Jharkhand jersey, motivating his state team in his usual 'captain cool' manner. Having given up other Captaincy, he has opted to lead in the upcoming domestic one-dayers for the Vijay Hazare Trophy.Dhoni wore his usual cool demeanour but the intensity was evident as he took out his team under the scorching afternoon sun and began the session in his familiar manner -- a pep-talk followed by playing football. He rolled his arms bowling off-spin, though IshanKishan is there, MSD would still keep the wickets and none can match his style, especially those runouts – receiving throws and pushing them on to the stumps, without caring to turn his head ! Jharkhand lefthander Virat Singh, who was instrumental in East Zone's recent Syed Mushtaq Ali Twenty20 title triumph, said they were privileged to play under the most successful Indian captain during his Vijay Hazare stint. For him like every other player, the presence of MSD motivates. Dhoni-led Jharkhand will open their campaign against Karnataka at Eden Gardens on February 25. Last season, Dhoni turned up for Jharkhand in the Vijay Hazare Trophy but not as a captain. This year, he was announced as the captain two days after IPL franchise Rising Pune Supergiants removed him from captaincy. The South Eastern Railway served a very special passenger when its former employee Mahendra Singh Dhoni preferred to travel by train with his Jharkhand one-day cricket team from Ranchi to Howrah to participate in the Vijay Hazare Trophy.Rewinding the clock back to his struggle days in early 2000s when he was posted as a ticket inspector in Kharagpur, India's most successful captain, Dhoni travelled in second-tier AC of 18616 Kriya Yoga Express. Reportedly it was not any special coach but the usual 2 AC which was block booked for 23 passengers including MSD. Thala is unique and rocks all the time. Away in Pune, the ball is not spinning to the like of India ! In Mar 1987, Gavaskar’s farewell test, Shivlal Yadav, Maninder Singh were turning the ball so much and there was Ravi Shastri – yet Iqbal Qasim and Tauseef Ahamed won the match on a turning match by pitching the ball at right places. The man at the start - Stephen Norman John O'Keefe, born in 1984 in Malaysia has played IPL and knew that it was his big chance, for he has often been bullied, more so, by Shane Warne. He has played 4 tests before, but never more than one in a series. One in Dubai, one in Sydney, one in Pallekele, another in Sydney. So when he saw a pitch that threatened to be a raging turner, he knew the pressure was on to perform. And, having been given the new ball to share with Mitchell Starc, O'Keefe went to lunch on day two with 0 for 23 from seven overs. This is a pitch on which 15 wickets tumbled on day two, including nine during a frenetic middle session, and on which India managed only 105 in their first innings. 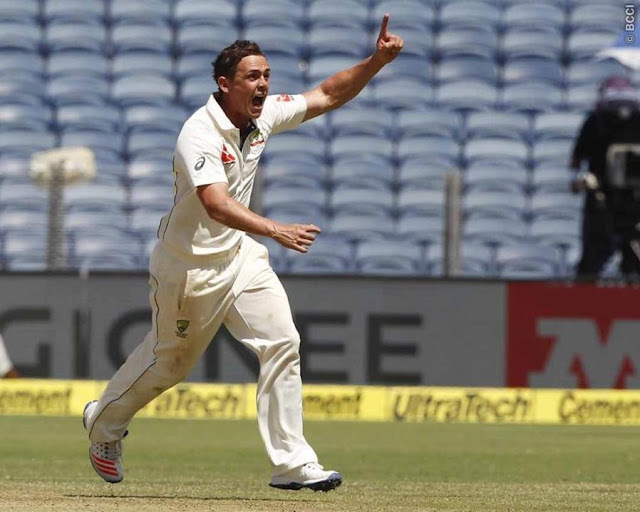 Steve O'Keefe ransacked the Indian middle and lower order for six wickets, which all came during a 25-ball spell after lunch. Three of those wickets came in one over, which triggered a stunning collapse during which India lost their last seven wickets for 11 runs, their worst such capitulation in Test history. Sad ! people die travelling by EMU - callous, who ?? In Dec 2012, in a gruesome accident that brought home the perils of footboard travelling, four students were fatally caught between a speeding city bus and a lorry on Rajiv Gandhi Salai. Two of them were college students, while the other two were going to school. The accident involving route number 519 deluxe bus took place around 8 a.m. close to Srinivasa Nagar 7th Main Road at Kandanchavadi. Chandan, an eyewitness, said the lorry was taking a left turn next to his fruit juice shop when the jam-packed bus was about to pass it. That was not the first nor the last – but was that an accident in a true sense – could it have been averted ? – why do people are so risky putting forth their life in endanger !! – who is to be blamed – and whoever the blame goes, there is no alleviation for the victim – is that not known. Chennai bursts at seams – you see maddening crowds everywhere, almost throughout the day - and commoners do suffer travelling in public transport. If buses are crowded, trains are overcrowded. 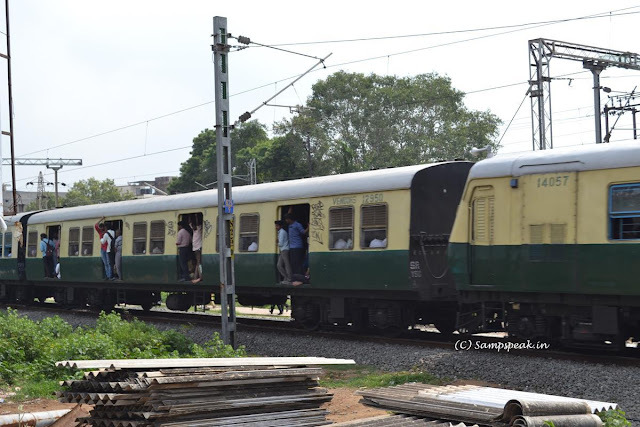 In an incident cruelly highlighting the pitfalls of travel on crowded suburban trains, three men died after falling off a train near Pazhavanthangal railway station yesterday morning. Four others were grievously injured. All seven had been hanging on to the footboard of a packed coach of a Chengalpet-Chennai Beach train. A high-level inquiry by the commissioner of Railway Safety would begin soon with a visit to the spot, a Southern Railway source said. Around 9am, police and railways officials said, the train had crossed Pazhavanthangal when the bag of one man, later identified as Manikandan, a 22-year-old AC technician, got entangled in a signal post on the tracks and he was dragged out. As he was falling, he instinctively grabbed at A Praveen Raj, a welder, and both men plunged down. They died instantly. Gory details and one shudders to think of the situation, even as one reads such accidents. Of the others similarly dragged down one by one, Samuel Jebasingh, 23, died while being taken to Chromepet General Hospital. K Gopinath, 29, M Manikandan, 20, S Devaraj, 26, and J Madhusudhanan, 27, are being treated at Rajiv Gandhi Government General Hospital. Soon after the incident, a team of Southern Railway officials conducted an inspection to see if the signal post was too close to the tracks.“We found there was nothing wrong from railways point of view. It has been classified as a T-1 accident, which puts the onus on the passengers,“ a spokesman said. ~and TOI has a caption – ‘ we have no options, says footboard travellers’ – what an irony ! how pathetic – is this the end sought !! The report states that many said if railways heeded suggestions to increase frequency of trains between Chengleput to Beach, accident could have been averted. The inability of the railways to run more frequent services is linked to the slow pace of capacity addition work on the section. A third line between Tambaram and Chengalpet has been sanctioned, but work is on at snail's pace. Even if it is completed, railways cannot increase suburban services as a fourth line is required. For the latter, Railway Board is not giving sanction as it wants the Tamil Nadu government to contribute equally to the capital expenditure. Trains from Chennai to Tambaram are available once every 10 minutes, but the same is not true for locations between Tambaram and Chengalpet. Between 9am and noon, there is only one train every 30 to 40 minutes. These stop at all intermediate stations and there are only two fast services from Chingleput. “It is inevitable that we have to travel on the footboard, often dangling dangerously. People take the risk as the next train is available after 30 minutes and is slower,“ a regular is quoted as telling Times of India. Though not the one travelling by the train and hence may not understand the practical difficulties that is being putforth, I tend to totally disagree. As Senior Government Railway Police officers say missing a train is better than putting one's life at risk. “GRP and Railway Protection Force (RPF) has organised awareness programmes to educate people on avoiding footboard travel. It is a punishable offence under Railways Act,“ a senior official said. Asked about steps taken to check footboard travel, an RPF official said, “Since many colleges fall on this stretch, students are regular footboard travelers. We conduct regular checks during peak hours and make sure they don't travel on footboards.’ According to RPF data, the Chennai Beach-Tambaram route is considered dangerous for footboard travellers. Thirteen people died and 40 were injured during 2015-16 on the route. Personnel from the Railway Police Force had a tough time pushing back the crowd that thronged the accident site to catch a glimpse of the bodies. But for residents of Thiruvalluvar Nagar and Jeevan Nagar located on either side of the tracks, the deaths are nothing new. They are familiar with the screams and shudders born out of urban helplessness. – does it not agitate your mind and heart to read this para – how can deaths be so normal ! – and who is callous here – is it the commoner who willingly or otherwise forced as they would like to be called putting their life to danger, lack of care by authorities – traveller getting by post is not new (if so, can they not be put at a little more distance ! ); the Govt local and Central, which have time for all squabbles, but not for transportation and other facilities; again the people, who agitate for some pettythings but carry on as if nothing is hindered in what should happen in their own interests. I really do not have an answer, but am feeling sad – lives lost, some hit headlines, they sound not even anguished – the next day, same things would continue, as if nothing untoward had happened. The situation many not be any different in any other Indian city ! The distance To Adelaide From Pune is: 9060 km and Matt Renshaw is a Queenslander !! At Pune on day 1 of 1st Test, Australia scrambled to 256/9 (good as compared to 205/9). On a pitch so dry, it was a fast bowler who came away with the richest haul. Umesh Yadav's combination of pace and reverse swing fetched him four wickets. A sizeable chunk of that total came off the blade of Matt Renshaw. The 20-year-old playing his first Test away from home made 68 off 156 balls – and then there was Michael Starc hitting all over the park. Even before a ball was bowled, Australia captain Steven Smith dropped a bombshell crying hoarse that the Pune track, was a rank turner. “I think it will take spin from ball one. There are a couple of divots out of the wicket as well,” Smith was quoted by the ‘Sydney Morning Herald’. He knows little of history. Gone are the days, when Aussies touted that Perth was a green park and visitors would fold within 2 sessions to their pace. Remember what was written earlier - a pacey man with unique action that put strains on his body and probably his weak heart quickened his quitting process. He was touted to be capable of delivering flat blows to the opposition – a promise he never fulfilled in his short career. Before the Perth test, when he was to be unleashed against the weak Indians, there were talks of Indians tumbling to his speed and perhaps getting all out in a session, if Ponting were to win the toss and put India in. It is another thing that things never went by the script and in Test no. 1862 – Border Gavaskar Trophy 34d Test at Western Australia Cricket Association Ground , Perth in Jan 2008 – India won by handsome margin of 72 runs. Shaun Tait bowled 13 overs conceding 59 runs and in the second essay bowled another 8 conceding 33 runs – more importantly went wicketless on a green top. Immediately after the Perth test, he walked away from cricket citing physical and emotional exhaustion. Did you notice that Australia has played two International matches at two continents within 15 hrs 50 mins !! Only recently they were playing at home against the visiting Sri Lankans. Asela Gunaratne orchestrated a remarkable heist to seal the T20 series for Sri Lanka – but the Aussies team was different. Michael Klinger made international debut at the age of 36; . Wicketkeeper Tim Paine was also picked, nearly six years after he last represented Australia in any format, while the uncapped fast bowler Jhye Richardson and allrounder Ashton Turner too were playing. A number of first-choice T20 players were unavailable for this squad as they had flown to India for the Test Series. Back home in Pune, Renshaw’s promising debut Test innings in India came to a sudden halt when he left the field due to an upset stomach nearing lunch on the first day. The setback had the potential to be a major setback for Australia after they had made an encouraging start on a day one pitch that is already showing signs of significant deterioration. The bizarre incident happened after opener David Warner was bowled by Umesh Yadav for 38. The vice-captain was followed off the field moments later by Renshaw, who left as captain Steve Smith was making his way to the middle. Renshaw was replaced by Shaun Marsh, leaving Australia with two new batsmen at the crease on a spinner's paradise. Border strongly believed Renshaw should have held out and waited until lunch to relieve his upset stomach. Remember that it was Alan Border who was at the helm in Chennai in 1986 when he famously told Dean Jones, who was ill and unbeaten on 202, during a tea break "we'll get a Queenslander out here" if the Victorian could not continue. Jones batted on. Matt Renshaw is a Queenslander ! "I hope he is lying on the table in there half dead. Otherwise as captain I would not be happy," Border said on Fox Sports. "I don't think I've ever seen that before. He's obviously just got an upset stomach to some degree and he was probably trying to use the situation where David Warner had just been dismissed to race off the ground and go to the toilet." .. .. .. Dean Jones who was at the receiving end in that famous 1988 Tied test - tweeted about Border's comments. Former captain Michael Clarke was stunned by Renshaw's abrupt departure but stopped short of criticising the 20-year-old. "Only 15 minutes until lunch, I can't believe Renshaw is retiring. He must be extremely sick and has a stomach bug and has to go to the bath room - this is unbelievable." The drama overshadowed Renshaw's valuable contribution at the top of the order. In between Jayant Yadav bowled David Warner off a big no ball and Wriddhiman Saha took a great flying catch. Despite the spin-friendly conditions, Australia decided against playing three slow bowlers, instead backing pace duo Josh Hazlewood and Mitchell Starc to capitalise should conditions be conducive to reverse swing. Seam bowling all-rounder Mitchell Marsh was recalled after being on the outer for five Tests. So 9 down for 256 is a win for bowling side – but Indians have to bat in the 4th innings – a result for sure ! 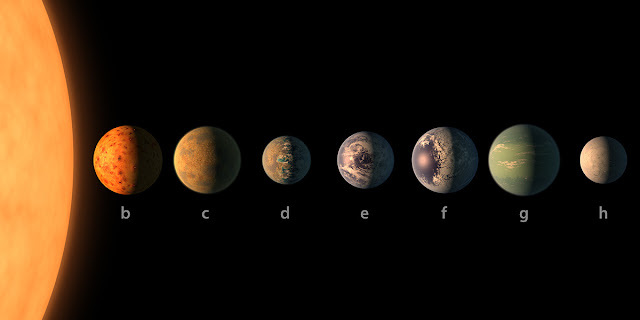 NASA unveils discovery of 7 earth sized planets - Trappist 1 !! During a recent travel, read my favourite Sujatha’s “Thisai Kanden Vaan Kanden” – amazed to read on his forethoughts on Astronomy and Science from a man who wrote so well about Alwargal, Thiruvarangam and its inhabitants - this is a sci-fi story, that of an alien from andromeda galaxy coming to Marina beach and moving to Washington DC in cyborg spaceship - assigned to serve notice to the leader of Universe on their proposal of annihilation of planet Earth as earth is in the middle of their hyper transit bridge !! Right from school days – Solar system has been generating lot of interest – at the same breathe, making feel that it is far too difficult to understand. The Solar System is the gravitationally bound system comprising the Sun and the objects that orbit it, either directly or indirectly. Of those objects that orbit the Sun directly, the largest eight are the planets, with the remainder being significantly smaller objects, such as dwarf planets and small Solar System bodies. Of the objects that orbit the Sun indirectly, the moons, two are larger than the smallest planet, Mercury. The Solar System formed 4.6 billion years ago from the gravitational collapse of a giant interstellar molecular cloud. The vast majority of the system's mass is in the Sun, with most of the remaining mass contained in Jupiter. The four smaller inner planets, Mercury, Venus, Earth and Mars, are terrestrial planets, being primarily composed of rock and metal. The four outer planets are giant planets, being substantially more massive than the terrestrials. The two largest, Jupiter and Saturn, are gas giants, being composed mainly of hydrogen and helium; the two outermost planets, Uranus and Neptune, are ice giants. All planets have almost circular orbits that lie within a nearly flat disc called the ecliptic. The first step in finding life outside our own planet is to find a planet like our own: small, rocky, and at just the right distance from the star that liquid water could exist on its surface. 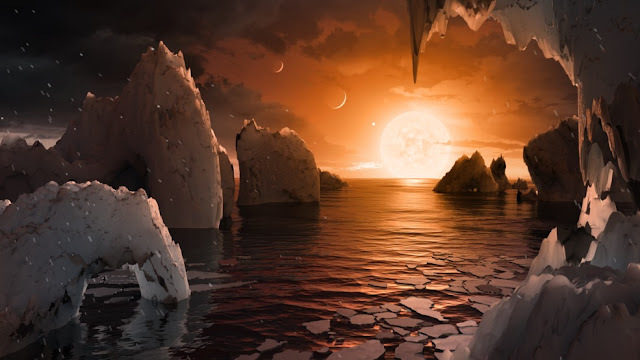 That’s why an announcement today from NASA is so exciting: The space agency, along with partners around the world, has found seven potentially Earth-like planets orbiting a star 40 light-years away. “It’s the first time that so many planets of this kind are found around a same star,” Michaël Gillon, the lead author of the Nature paper announcing the discovery, said in a press conference. “The seven planets … could have some liquid water and maybe life on the surface.” Three of the planets are directly in the star’s habitable zone, meaning water can mostly likely exist on the surface of them. One of them, Gillon said, has a mass “strongly to suggest a water-rich composition.” And it’s possible that the other four could have liquid water, too, depending on the composition of their atmospheres, the astronomers said. In a pathbreaking discovery, a press release on February 22, 2017, NASA announced the discovery of the most Earth-sized planets found in the habitable zone of a single star, called TRAPPIST-1. This system of seven rocky worlds–all of them with the potential for water on their surface–is an exciting discovery in the search for life on other worlds. There is the possibility that future study of this unique planetary system could reveal conditions suitable for life. NASA's Spitzer Space Telescope has revealed the first known system of seven Earth-size planets around a single star. Three of these planets are firmly located in the habitable zone, the area around the parent star where a rocky planet is most likely to have liquid water. The discovery sets a new record for greatest number of habitable-zone planets found around a single star outside our solar system. All of these seven planets could have liquid water – key to life as we know it – under the right atmospheric conditions, but the chances are highest with the three in the habitable zone. “This discovery could be a significant piece in the puzzle of finding habitable environments, places that are conducive to life,” said Thomas Zurbuchen, associate administrator of the agency’s Science Mission Directorate in Washington. “Answering the question ‘are we alone’ is a top science priority and finding so many planets like these for the first time in the habitable zone is a remarkable step forward toward that goal.” At about 40 light-years (235 trillion miles) from Earth, the system of planets is relatively close to us, in the constellation Aquarius. 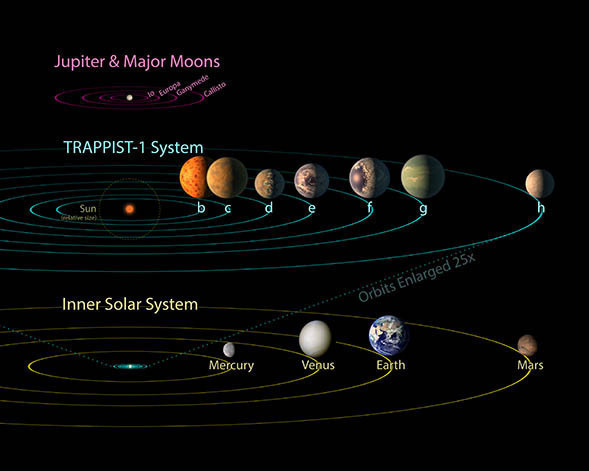 Because they are located outside of our solar system, these planets are scientifically known as exoplanets. The new results were published Wednesday in the journal Nature, and announced at a news briefing at NASA Headquarters in Washington. Using Spitzer data, the team precisely measured the sizes of the seven planets and developed first estimates of the masses of six of them, allowing their density to be estimated. Based on their densities, all of the TRAPPIST-1 planets are likely to be rocky. Further observations will not only help determine whether they are rich in water, but also possibly reveal whether any could have liquid water on their surfaces. The mass of the seventh and farthest exoplanet has not yet been estimated – scientists believe it could be an icy, "snowball-like" world, but further observations are needed. In contrast to our sun, the TRAPPIST-1 star – classified as an ultra-cool dwarf – is so cool that liquid water could survive on planets orbiting very close to it, closer than is possible on planets in our solar system. All seven of the TRAPPIST-1 planetary orbits are closer to their host star than Mercury is to our sun. The planets also are very close to each other. If a person was standing on one of the planet’s surface, they could gaze up and potentially see geological features or clouds of neighboring worlds, which would sometimes appear larger than the moon in Earth's sky. The planets may also be tidally locked to their star, which means the same side of the planet is always facing the star, therefore each side is either perpetual day or night. This could mean they have weather patterns totally unlike those on Earth, such as strong winds blowing from the day side to the night side, and extreme temperature changes. "This is the most exciting result I have seen in the 14 years of Spitzer operations," said Sean Carey, manager of NASA's Spitzer Science Center at Caltech/IPAC in Pasadena, California. Following up on the Spitzer discovery, NASA's Hubble Space Telescope has initiated the screening of four of the planets, including the three inside the habitable zone. These observations aim at assessing the presence of puffy, hydrogen-dominated atmospheres, typical for gaseous worlds like Neptune, around these planets. Vastly reproduced from : NASA; www.nasa.gov. they were talented but opportunities never beckoned for them !!! I vaguely remember that in 1983, Triplicane suddenly became abuzz – news was TA Sekar, a quickie of Tamil Nadu team had been called mid-way to Pakistan as a replacement. In mid-noon, he visited Sri Parthasarathi Swami temple and a few youngsters ran behind him, not knowing how to reach to him, may be to touch and shake hands with him, or get his signature – not the days, when could take a selfie !! There have been some touted very fast – yet not made the cut at the National level, for no fault of theirs. The big burly Yograj Singh was said to be faster than Kapil Dev by yards, toured Australia / New Zealand – played his only Test at Wellington took a wicket in the only innings that he bowled. In the 2nd NZ were all out for 100, but Yograj did not get to bowl. Thirumalai Ananthanpillai Sekar landed in Pakistan not knowing what to do – perhaps not at all coordinated and made his debut immediately upon landing, in ODI no. 172 at National stadium, Karachi. A could of days later on 23rd Jan 1983, he made his Test debut at Gadaffi Stadium, Lahore. That was to be a disastrous tour for India. TA Sekar had been a quite sensation at home with his quality pace with red cherry, troubling almost all the batsman, including those big names in Indian Test cricket. In Ranji, he got a wicket off his very first ball. Sekar was to replace the injured Madanlal at Pakistan and perhaps was not at all that supported by the team stalwarts. In the final Test at Karachi, the 6th of the long Series, Dilip Vengsarkar dropped Mudassar and Javed Miandad in the same over and another one went abegging those were the days, when Indian slip fielders would stand with hands on hip and would walk to retrieve the ball from boundary. Fast bowlers, especially with little experience could do little, cannot even stare at them ! One cannot help hazarding a guess, what those catches could have done to his career !! He last represented India in a 15 over match !! – it was ODI 298 at Sector 16 Stadium, Chandigarh on 27 Jan 1985. In rain shortened match, England made 121 off 15 overs. 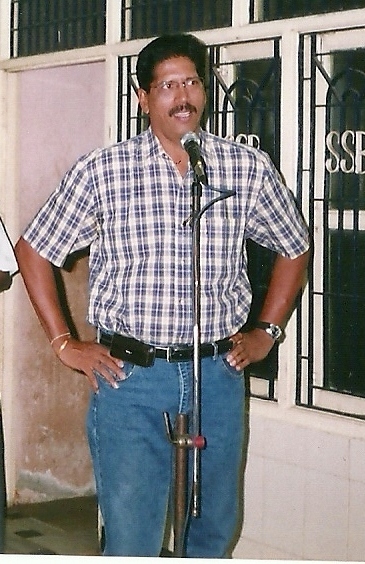 TA Sekar had figures of 3-0-23-3 bowling alongside Kapil Dev, Manoj Prabhakar, Chetan Sharma and Ravi Shastri. The 1970s was even worser – have heard of Barun Burman who lost out to Kapil Dev for that 1978 Pak tour. Kapil was phenomenal beginning in that tour and blossomed much. Nothing to beat this perhaps ~ read this interesting article in ESPN Cricinfo stating that this man would make debut at 67 ! - it is about Pandurang Salgaoncar, who would make a Test debut on Thursday, and he be damned if someone denies him this time. Those who have watched Salgaoncar, (67 now), bowl in the 1970s swear by his pace. Salgaoncar himself never tires of telling you how he made batsmen run away in fear. He once hit Sunil Gavaskar on the hand, forcing him to miss the next Test. That was enough to spread the word in the whole country but the selectors. He came close to playing for India on three occasions, all in the two years leading to first World Cup. In Nov. 1972, in the Duleep Trophy semi-final between South and West Zone in mid-November featured many of the stars of those recent Test victories. Farokh Engineer (by then a rarity on the domestic circuit, as he lived most of the year in Lancashire) was West Zone's keeper. More enticingly, Nawab Mansur Ali Khan of Pataudi was returning to cricket after a self-imposed exile from the game. He joined Gundappa Viswanath in the middle order of South Zone's batting line-up. Still others (Ramnath Parkar and Michael Dalvi, for instance) were knocking on Test cricket's doors. Today's fans might be taken aback to know that Chepauk was filled to the brim for a domestic encounter. With such an all-star cast, the show was stolen by a relatively unknown West Zone player: a strapping young fast bowler with a disarmingly toothy smile, called Pandurang Salgaoncar. In those days, Chepauk was a square turner of a pitch, where nearly all the wickets accrued to spinners and most matches were low-scoring thrillers. In South's first innings, Salgaoncar finished with 5 for 55 off about 18 overs, but it was in the second innings that he really lit up the place. When South began their second innings 83 runs in arrears, and we were well into the final day's morning of a three-day match, a draw loomed as the most likely outcome. As the shocked Chepauk crowd dispersed, our partisan disappointment at losing the match was greatly tempered by the thought that maybe, just maybe, we had finally unearthed a genuine fast bowler. Yet barely 38 overs later (17 of which were bowled by Salgaoncar), South had been skittled for 97 runs and West won the match outright by ten wickets shortly after tea. Salgaoncar ran through South's line-up like a freight train crashing through a picket fence, timber flying all over the place. He picked up another five-for, this time for 56 runs, to make it ten for the match. Less than a week later, Salgaoncar was at it again. In the Duleep final he grabbed 7 for 72 in the first innings as Central Zone careened to an innings defeat. Yet, he could not break into the Indian team. Month later, India's new-ball "attack" plumbed the depths by the third Test, at Chepauk, when Eknath Solkar and Sunil Gavaskar took the shining cherry in the first innings, and (dispensing any pretense at all) Bishan Bedi joined Solkar to open the bowling in the second. Though Salgaoncar was strongly tipped to catch the flight to England as India's tour got underway in May of 1974, he again, inexplicably, did not make the cut. In fact, Salgaoncar never played for India. Salgaoncar went to Sri Lanka to play unofficial Tests in 1974, and fondly remembers a match in which he bowled 24 overs out of 55.4 to help enforce a follow-on. He then bowled 38 overs in the follow-on. Madan Lal was his new-ball partner in that match. He took 10 wickets to Salgaoncar's seven, and made it to the England tour later that year. Representing West Zone against a strong West Indies XI, Salgaoncar took out Roy Fredericks and Alvin Kallicharan in his first spell but lost out to Abid Ali, who would allow Tiger Pataudi to play an extra spinner. In 1975, Salgaoncar says, he bowled 12 overs for 11 runs in a trial match for World Cup team selection, but wasn't chosen. Salgaoncar has recently had bariatric surgery to get rid of more than 20 kilos, and with that diabetes etc. "I can eat any sweets I want," he says, but there is a certain bitterness towards India and Indian cricket that still persists. He is now the curator at the MCA Ground in Pune. "This is finally going to be my Test debut," he says. The Smithsonian's National Zoo and Conservation Biology Institute began as the dream of William Temple Hornaday, chief taxidermist at the Smithsonian. During a trip to the western United States in 1887, he was shocked and troubled by what he didn’t find—large herds of American bison. The species, which once roamed the American West by the millions, was reduced to a few hundred animals. The bison’s near extinction sparked Hornaday’s crusade to save it and other endangered species from disappearing completely. He became the first head of the Department of Living Animals at the Smithsonian later that year, and brought 15 North American species to live on the National Mall in Washington, D.C.
Chinese Ambassador to the US Cui Tiankai once called Bao Bao the second Chinese ambassador in Washington. That panda is in news ! The giant panda (Ailuropoda melanoleuca) is a bear native to south central China. 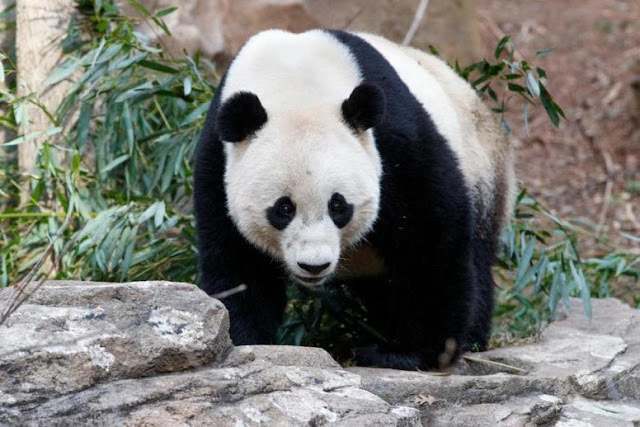 Easily recognizable by the large, distinctive black patches around its eyes, over the ears, and across its round body, its diet is over 99% bamboo. The giant panda lives in a few mountain ranges in central China, mainly in Sichuan province, but also in neighbouring Shaanxi and Gansu. A few months ago, the World’s oldest panda in captivity was put down at the Hong Kong theme park where she lived, because her health had deteriorated. Ocean Park stated that a veterinarian euthanised 38-year-old Jia Jia to prevent further suffering and for ethical reasons. Guinness World Records recognised Jia Jia as the oldest giant panda to live in captivity. The average lifespan for a panda in the wild is 18 to 20 years, while in captivity it is 30, according to Guinness. Born in the wild, Jia Jia was taken at a wildlife reserve’s breeding centre in Sichuan province, central China, in 1980, when she was about two. Jia Jia and another panda, An An, were given to Hong Kong as a gift from Beijing in 1999, on the second anniversary of the city’s handover from Britain to China. 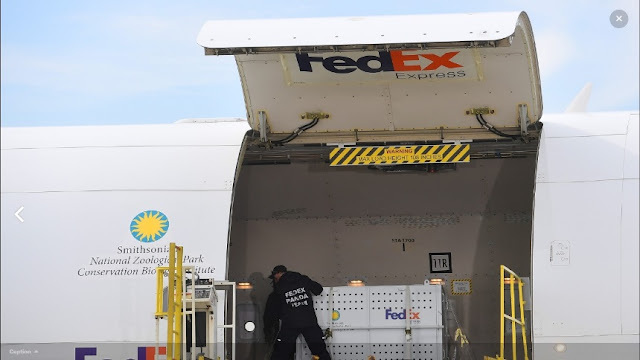 This post is more about ‘bao bao’, a three-year-old giant panda who has called the Smithsonian’s national zoo in Washington home since her birth in 2013, departing from Dulles airport this afternoon on a one-way trip to China to join a panda breeding program. China’s ambassador to the US Cui Tiankai was at the zoo to receive the panda, who will travel with a keeper and veterinarian for company on the 16-hour nonstop flight to Chengdu. 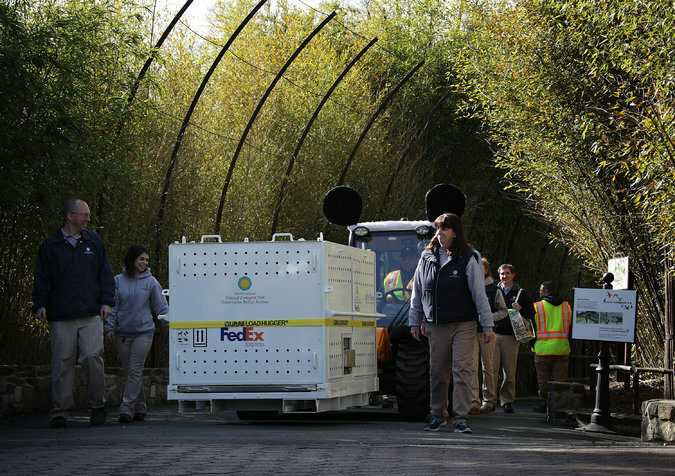 Bao Bao’s journey began in a crate loaded onto a Fedex truck also travels with a supply of snacks including 55lbs (25kg) of bamboo, 5lbs (2kg) of apples and 2lbs (1kg) of sweet potatoes. 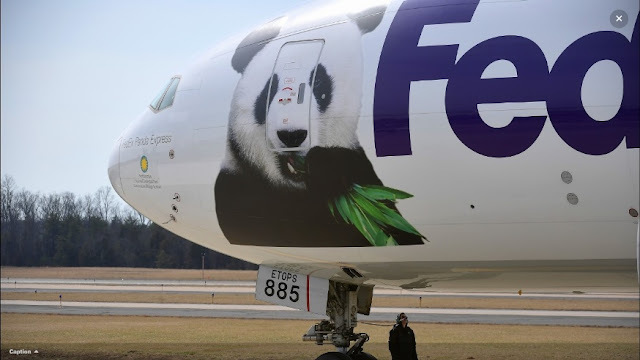 Bao Bao, whose personality is described as “very independent”, like a domestic cat, was then loaded aboard a specially chartered FedEx plane – the “Panda Express”– in a large box marked “one panda”. The plane departed around 2pm, an event covered on live TV and on the zoo’s Facebook page. “Most of the flight, we hope she’s going to eat,” panda keeper and travel companion Marty Dearie told the Associated Press. Dearie added that pandas like to spend 13-16 hours a day eating. The national zoo explained that Bao Bao is traveling now because it’s better for pandas to travel in the winter months, when it is cool. The cub departed Tuesday on a 16-hour, nonstop flight from Dulles International Airport to Chengdu, China. – media reports suggests that it has landed in China about a couple of hours back [22.02.17 @ 07.30 IST]. Bao Bao will eventually join a panda breeding program. As part of the National Zoo’s cooperative breeding agreement with the China Wildlife Conservation Association, all cubs born at the zoo move must move back to China by the time they turn 4 years old. Bao Bao will turn 4 on Aug. 23, 2017. The return of Bao Bao continues a tradition that began when China gave the national zoo a pair of pandas, Ling-Ling and Hsing-Hsing, following Richard Nixon’s historic trip to the country in 1972. The pair had five cubs, but none survived. Mei Xiang and Tian Tian are the zoo’s second panda pair. Under the terms of the agreement, the US pays China $10m for a renewable 10-year lease on the couple. A total of four US zoos have pandas on loan from China. In addition to Bao Bao, the US sent two female twin pandas, Mei Lun and Mei Huan, from Atlanta zoo to China in November last year. That leaves a dozen pandas remaining in the US: four in Atlanta, three in Washington, three in San Diego and two in Memphis. But – there would always be difference of opinion on captive breeding programmes rather than protecting them in the wild. A zoo in northern Japan has culled 57 of its snow monkeys by lethal injection after discovering they carried the genes of an "invasive alien species". Takagoyama Nature Zoo in Chiba said DNA testing showed the monkeys had been crossbred with the rhesus macaque. The non-indigenous rhesus macaque is banned under Japanese law. A local official said they had to be killed to protect the native environment. Japanese macaques, commonly known as snow monkeys, are native to Japan and are one of the country's major tourist attractions. Japan prohibits the possession and transport of invasive species, including crossbreeds. An official from the Office for Alien Species Management, part of the country's environment ministry, told local media that the culling was unavoidable because there were fears they might escape and reproduce in the wild. Another spokesman for conservation group WWF Japan told AFP news agency that invasive species cause problems "because they get mixed in with indigenous animals and threaten the natural environment and ecosystem".